Mind Mapping? : How Chuck Frey’s Blog Illuninated me. Mind Mapping comes to mind every few months. I hear about it; think it sounds like yet another good productivity technology I should embrace and then I forget about it because I don’t get it. It was not that I could not “get it” at a conceptual level, but that I could never see how mind mapping could seamlessly fit into my workflow. But thanks to an article, which led to to the blog by Chuck Frey I now can see it. 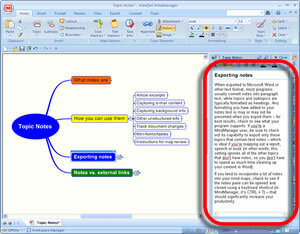 “How to get the most out of topic notes in your mind maps”. Continue reading, “How to get the most out of topic notes in your mind maps”. Not exactly mind mapping but it made me think about Compendium, which seems even more anthro-friendly than most mindmapping software. I’m an outliner geek myself and I frequently get intrigued by mindmapping, but there’s room for less hierarchical ways to organize ideas. i find all these mind mapping programs simplistic compared to how i imagine the real mind operates: with lots of Flash, Anime, and a hearty injection of random memory. And a combination hard/soft drive? And somewhere, may a little less accessible in most minds, there is a surefire rapid calculating machine. What exactly did you take away from the innovation, game, etc. unconference yesterday? Anything to write about? I read one of your earlier blogs and remembered (hard/soft drive memory) my interview with Claude Levi-Strauss for a radio show I used to coproduce for CBS Radio called Science Editor. I think L-S was only in his 70s but his English was so bad it was incomprehensible for radio so I couldn’t use any of the interview, which was mostly about Tristes-Tropiques and my queries, mostly about what’s so good about living like that (in a pre-medieval state).